When we got back home after a nice fish ‘n’ chip meal out (well, I did save loads on the shopping front), the creative bug was biting me but there wasn’t much time before the school run to make anything elaborate. 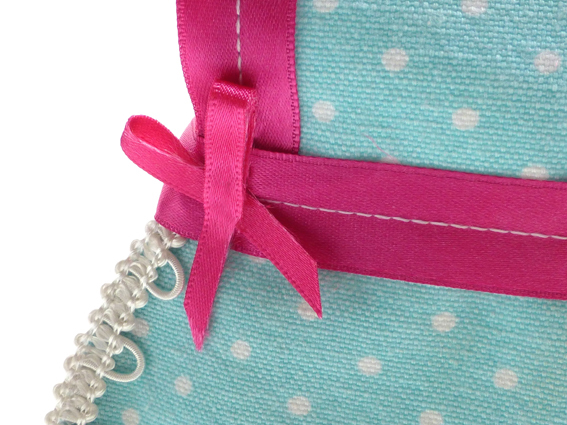 Cue a new blog post from After Dark Sewing (Thanks Beth!). You’ll never guess what it is so I’ll enlighten you. 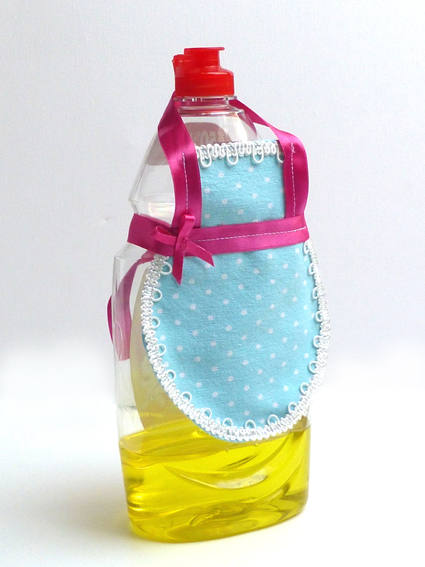 But not just any old apron, oh no…..
…an apron for your washing up liquid bottle!!! Totally mad and pointless, I just HAD to make it! Do you want to see how it looks from the back? No? Well I’m going to show you anyway. 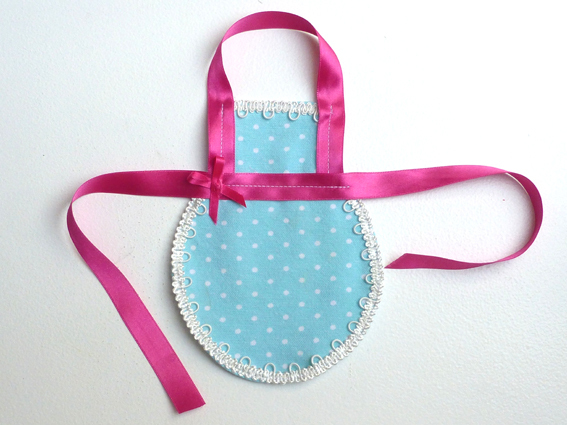 It absolutely did NOT need any embellishment (it’s a bottle cozy for goodness sake! 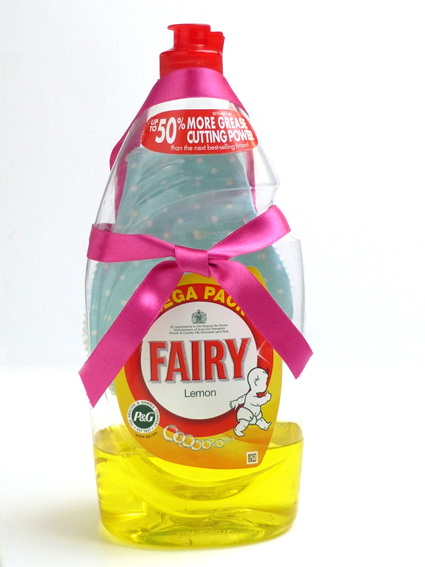 ), but I made a bow just because I could. Now it’s sitting pretty on my kitchen windowsill making me smile every time I look at it. 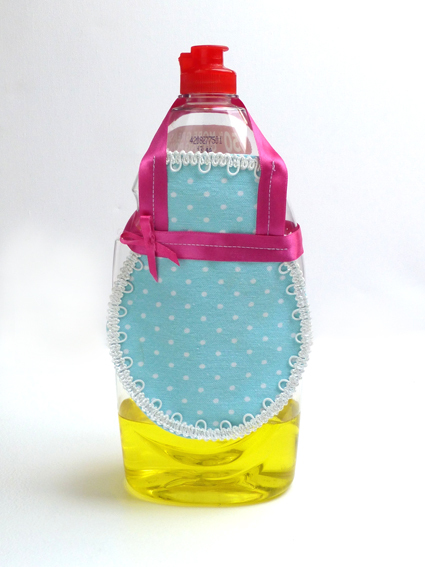 If you want to make your own Washing Up Liquid Bottle Cosy (you know you want to! ), the original post is here over at Hostess with the Mostest. Aw! That was quick! I love the trim on yours. I wish I had something like that to use! Ok…. 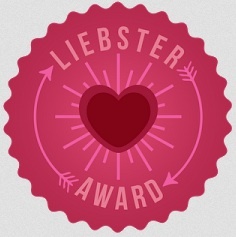 you’re aware that you drove me crazy with this fancy and sweet project,aren’t you…………? Fifteen minutes of your time and you can join the list of crazy people who have already made this!! Isn’t it ridiculous?! My husband’s face was a picture….! 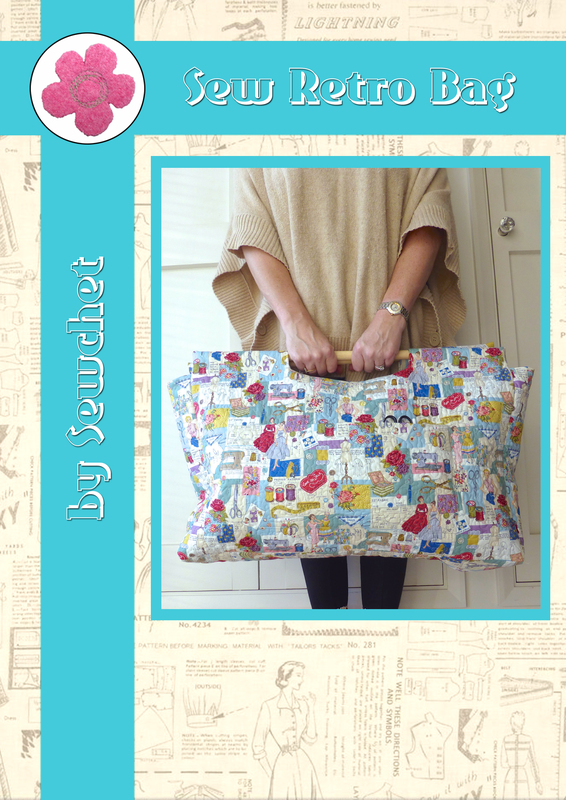 I am also on a mission to find the worlds naffest loo roll cover pattern and make one for my sister….. This is so sweet, silly and stylish rolled into one – brilliant 😉 !!! You HAVE to make a Christmas one!